The Foodie Blogroll and Marx Foods teamed up and sent a sample of Dulse Seaweed, Fennel Pollen, Bourbon Vanilla Beans, Maple Sugar, Dried Porcini Mushrooms, Tellicherry Peppercorns, Smoked Salt and Aji Panca Chilies to each of the 25 Iron Foodie Challengers. Each blogger’s task was to create an original recipe incorporating at least 3 of the 8 ingredients. As you’ll see below, the Iron Foodie Challengers delivered! La Bouna Cucina’s timpano recipe was voted the best by readers of the Marx Foods blog, with Cookistry’s ice cream recipe being voted the best by the other bloggers participating. Thanks to all of the bloggers for contributing to this delicious recipe collection. And a special thanks to the Foodie Blogroll for making this possible! 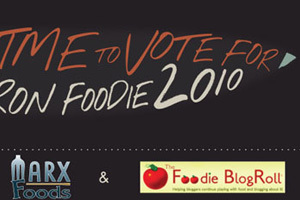 Can anyone vote or just Foodie Blog members? Voting is open to all! really really good love creme brulue. directions were great. SWEET, SPICY & SMOKY ASIAN SHRIMP **ROCKS** from FOODALOGUE!!! try it today and VOTE!! Well I can’t pronounce it but it sure looks tasty. Have to go for the Warm Soup!! Why I cannot seem to vote for At Home With Rebecka? I don’t see the word “VOTE” as I did two days ago! HELP !! Good luck everyone! I am so impressed with the creative and delicious looking recipes! It is so hard to have only one vote! I can’t figure out how to vote. There is no “vote” badge… only the percentages are showing up. They all look great! Good luck, everyone! Congratulations! This is a good website specially for those who are really loves to cook in different style and you can learn from it. I really love this recipe looks so yummy… i would love to vote for it. Goodluck! I want to wish everyone “Buena Suerte”! I’ll give Kate my vote, she sounds delightful. I’m Jan’s old neighbor.